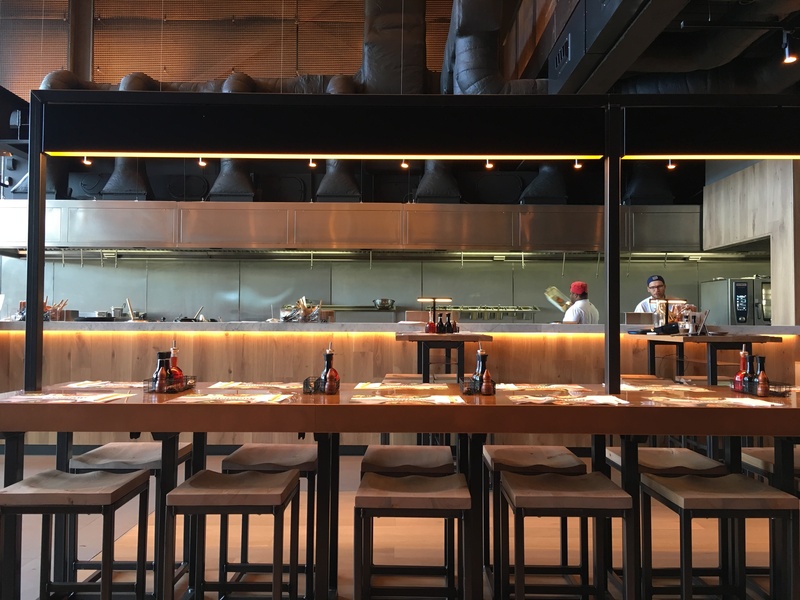 WAGAMAMA ST ANDREWS SQUARE EDINBURGH | mymonkfish - Food and drink news, Edinburgh, Scotland and beyond. 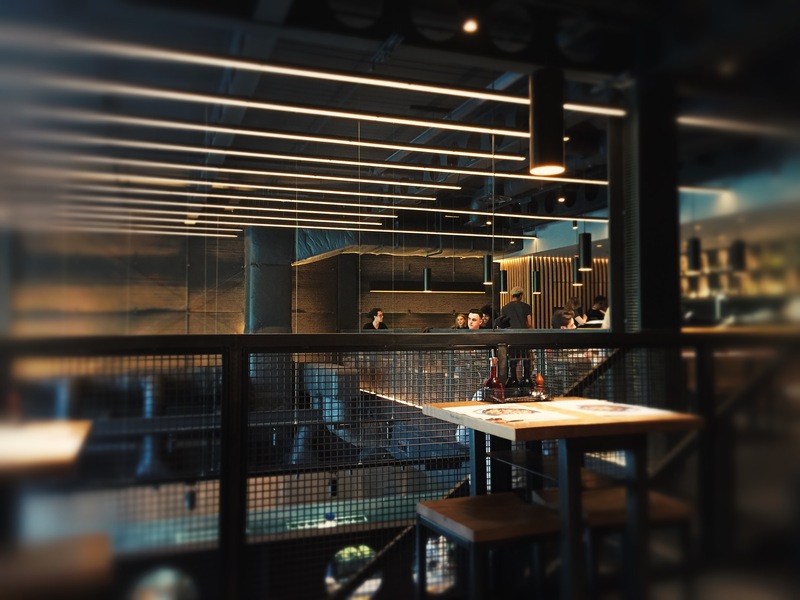 Yes it’s a chain but there has been some serious thought put into the layout, decor, interiors, (call it what you will), of this particular Wagas as it’s pretty funky and is definitely more interesting than it’s sister outposts on Lothian Road and Ocean Terminal. Both of these have looked rather tired of late so this restaurant makes them look like they really know what they are doing rather than following the same old format. All good so far! 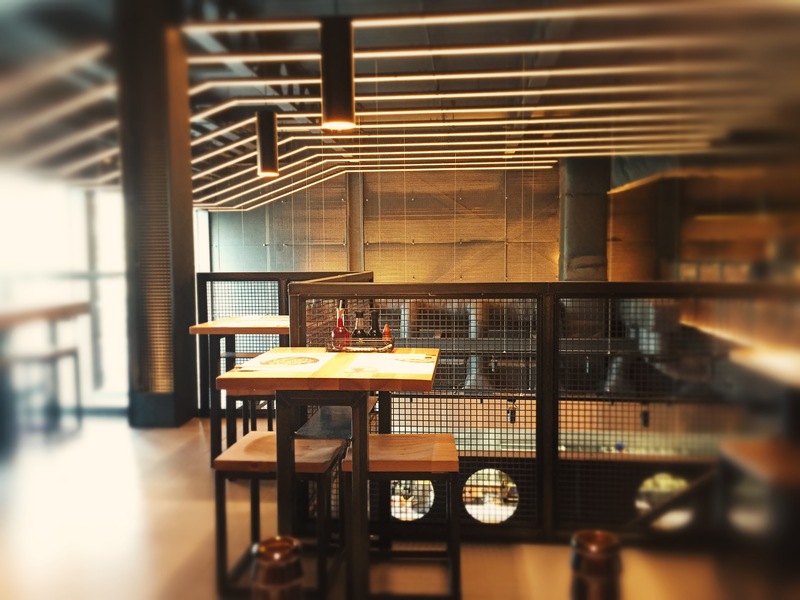 Metals, wood, iron grid staircase (eek don’t look down if you’re scared of heights), cosy booths for 4 or 6, the longest communal tables in town which seats at least 20 , bathroom doors with funky rubber closers so you can’t possibly trap your fingers in them if you’re 4 years old….. Tick tick. And we love the view of the kitchen, it’s awesome, please go check it out. So, what of the food? Well, expect mostly the same although some dishes have been ‘refreshed’ ie they’ve added a few extra ingredients or taken some away. PLUS, there are some new summer dishes which tick all the nutrition boxes for me. 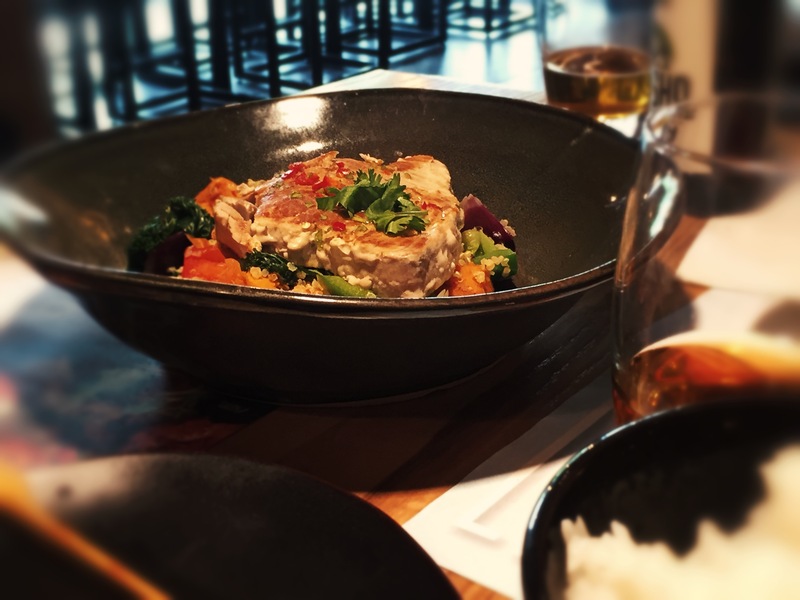 The tuna dish – ‘seared nuoc cham tuna steak’ is an update on their previous tuna dish and is served on a bed of quinoa with stir-fried kale, sweet potato, edamame beans, red onion and peppers. and garnished with coriander. It’s tasty, but could definitely do with some sauce to help it along a bit as it was a bit dry. However, a bottle of the new Wagamama collaboration craft beer went really nicely with it and sorted the sauce issue out. Wagamama has collaborated with Meantime Brewing Company to produce two new craft pale ales that are now exclusively available at wagamama restaurants. The Asian-inspired ales, Kikku and Kansho, were created by executive chef, Steve Mangleshot with Ciaran Giblin, Meantime’s head brewer. Kikku, meaning ‘kick’ in Japanese, is a shichimi infused pale ale. 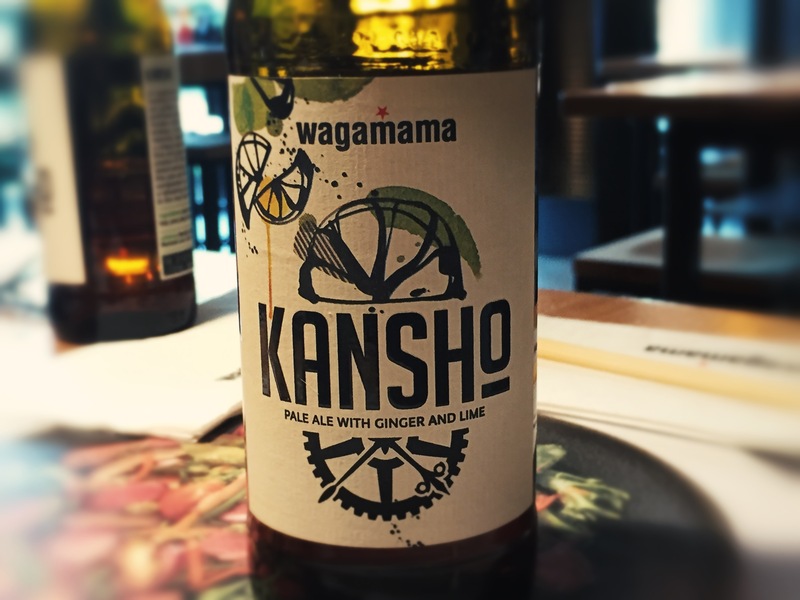 Kansho, meaning ‘zesty’, has been brewed using fresh lime and ginger. 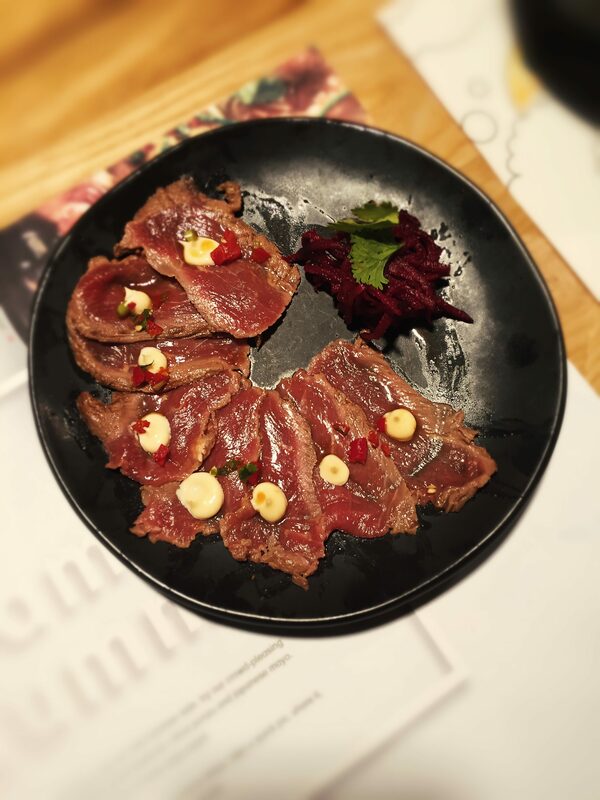 The new starter of Beef Tataki hits the body builder macro boxes well and truly. The lightly seared marinated steak (it literally just hits the pan, in fact, it pretty much just waves at the pan and then jumps straight back out), is thinly sliced and served chilled. Dressed with citrus ponzu and japanese mayonnaise and served with a side of pickled beetroot and coriander I loved it. There’s also a pad thai salad to try plus a pork belly dish, a grilled bream donburi and two new chicken curries. You can check out all of the new Summer dishes HERE. For kids Wagamamas is great. 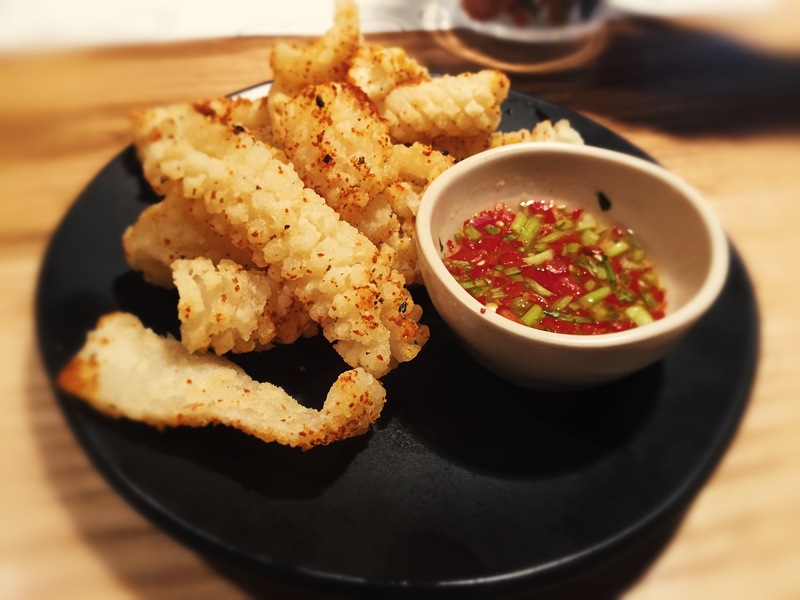 Their own menu which has some good choices on it, the colouring in, their cool chopsticks, the attention from the staff… Having said that Mini prefers to go directly to the ‘grown up’ menu and order his predictable favourites of Chilli Squid and whatever Gyoza he can get his hands on. Some boy. If you can fit dessert in you’re a better man (woman) than I am. Although on this occasion I did manage to squeeze a sorbet in which was really delicious. The men in the Monkfish family opted for salted caramel ice cream which again was very good. Must mention the juices too. The carrot and ginger is always a winner as are the green juices too. Oh, and the never ending FREE green tea. We’ll be back. Of course we will. We love eating out and are so lucky to live in Edinburgh when it comes to choice. Sometimes you want to eat something you’re familiar with, that’s fast, easy, relaxed and in the centre of town. Wagamama St Andrews Square Edinburgh will do well just because of that exact thing, location location location. Kirstie and Phil must be raving about it. 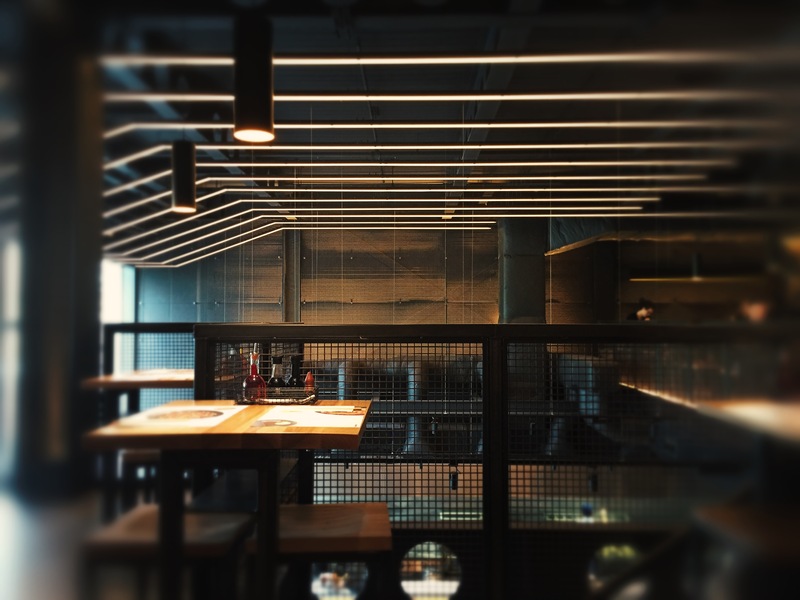 This entry was posted in edinburgh, reviews and tagged wagamama st andrews square edinburgh. Bookmark the permalink.